The E. coli scare at Chipotle restaurants last year may still be keeping once-loyal burrito bowl fans from coming back. And now some Wall Street analysts are wondering if it's not a matter of when they will return, but if they will return. Shares of Chipotle (CMG) fell to their lowest level in nearly three years on Tuesday. A bearish report from Deutsche Bank analyst Brett Levy on Monday appears to have sparked the most recent round of selling. Levy wrote that Chipotle's profit margin potential is now highly uncertain as sales continue to decline. And he even said that some customers "may be lost for good." Levy, who already had a "sell" rating on Chipotle, cut his price target to $340. That's about 15% lower than current levels. Chipotle is currently trading at around $390. That's not a good sign. And Levy isn't the only one who thinks that it's going to take a while longer before people regain their trust in Chipotle. A recent customer survey from The Harris Poll showed that many consumers now prefer to get their Tex-Mex fix from privately held Moe's Southwest Grill instead of Chipotle. Chipotle is also facing tougher competition from Qdoba -- which is owned by Jack in the Bo (JACK)x -- as well as Yum! Brands (YUM)' Taco Bell. Ironically, former Chipotle parent company McDonald's (MCD) -- which is enjoying an amazing comeback under newish CEO Steve Easterbrook -- could be eating into Chipotle's sales too. RJ Hottovy, an analyst with Morningstar, said that social media may be one reason why consumers remain skittish. It's kept Chipotle's problems in the spotlight for longer as people tweet, Instagram and post to Facebook and Snapchat about short lines at the stores. Hottovy added that the fact that Chipotle still hasn't identified what ingredient or ingredients actually led to the outbreak is worrisome -- even though Chipotle has made numerous changes to its supply chain management process to prevent future problems. The fact that the Centers for Disease Control and Prevention has officially declared that the outbreak is over doesn't seem to matter either. "The recovery process is going to take more time than previous food safety issues we've seen in the past," he said, referring to a deadly E. coli outbreak at Jack in the Box in 1993 as well as an outbreak at Taco Bell in 2006. 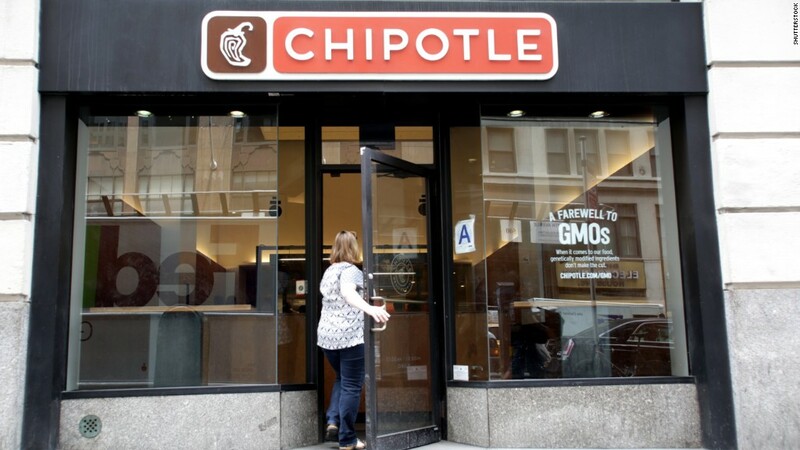 "Consumers are skittish since Chipotle never discovered the root cause of the problem. Customers appear to be less forgiving," Hottovy added. Hottovy thinks that Chipotle's same-store sales -- a key measure of health in the restaurant industry -- will plunge 20% in the second quarter. That's obviously bad news, even though it's actually an improvement over the 30% same-store sales drop in the first quarter. Chipotle is not expected to report a loss as it did in the first quarter. But that's small consolation for investors who've grown accustomed to the company reporting one quarter after another of strong sales growth. And with analysts predicting a nearly 70% drop in Chipotle's earnings per share for all of 2016, it looks like investors aren't going to be lining up for the stock until customers are lining up outside the stores once again.